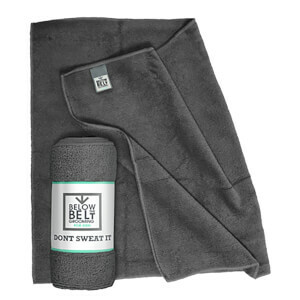 Save 25% + Receive a FREE Below the Belt Microfibre Towel when you buy 2 or more. Stay comfortable around the clock with Below the Belt Grooming Gift Box - The Cool Collection. A perfect treat for the male who likes to feel fresh and clean on-the-go. A calming groin-area 'deodoriser' infused with a refreshing fragrance. Working like any other antiperspirant, the formula helps to keep you fresh, dry and smelling great down below, applying as a gel and drying into a silky veil that keeps your nether regions dry and comfortable for hours. Delivering long-lasting freshness, it's the perfect partner for long haul flights or relentless shifts in the office. An easy-to-use spray that immediately refreshes your nether regions when there's no time to shower. Infused with a fresh fragrance, the formula works to keep your under carriage hygienic and odour-free when time isn't on your side. Simply spray around your balls and enjoy long-lasting freshness. You'll feel fresh, cleansed and ready to go in seconds. Gel: Apply after showering to stay fresh and dry for up to eight hours. Spray: Apply whenever a shower is not possible, for an instant clean feeling. Gel: Aqua (Water), Aluminium Starch Octenylsuccinate, Cyclopentasiloxane, Alcohol Denat., Propylene Glycol, Phenoxyethanol, Dimethicone/Vinyl Dimethicone Crosspolymer, PEG-40 Hydrogenated Castor Oil, Trideceth-9, Acrylates/Vinyl Isodecanoate Crosspolymer, Acrylates/C10-30 Alkyl Acrylate Crosspolymer, Sodium Hydroxide, Menthyl Lactate, Parfum (Fragrance), Aloe Barbadensis (Aloe) Leaf Juice, Silica, Isoceteth-10, Hexyl Cinnamal, Linalool, Benzyl Salicylate, Butylphenyl Methylpropional. Spray: Aqua (Water), Alcohol Denat., Propylene Glycol, PEG-40 Hydrogenated Castor Oil, Trideceth-9, Betaine, Glycerin, Phenoxyethanol, Menthyl Lactate, Zinc PCA, Parfum (Fragrance), Disodium EDTA.